There’s a small wooden bridge inside the round pen, well not even a bridge but a bridge simulator that’s really a solid wood square for horses to step on and walk over. Horses check it out and most of them look down at it, sniff or touch it with their nose and then quietly walk over it no problem. Some hesitate but with coaxing agree to try and cooperate quickly. 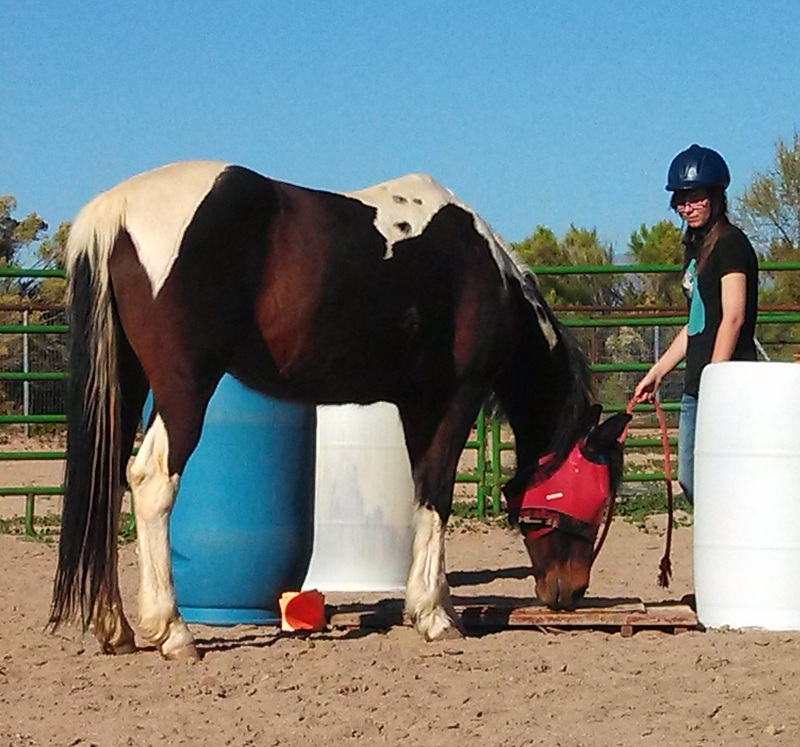 Then there’s Chanoah, an awesome trail horse, about seventeen years old, a beautiful Paint horse. She wants to please and is a “been there done that” horse and even though older still very fast and extremely quick to decide if she should save herself rider or no rider. We have tried the bridge many, many times. She stops, backs up, gets parallel with it, gets sideways with it. She absolutely refuses to even touch it. If pressured she jumps it. The more one tries the worse it gets. She will bolt, try to leave, pull back and finally jump it but not touch it or walk on it. Having tried every trick and tip for cooperation on her part the most progress was to have the tip of her front feet barely touching the bridge with her sniffing it. Could we use more “motivation”? Sure but quiet cooperation is the result we want. So now she stands with her toes touching the edge and she leans down and sniffs it but any forward movement is a leap. 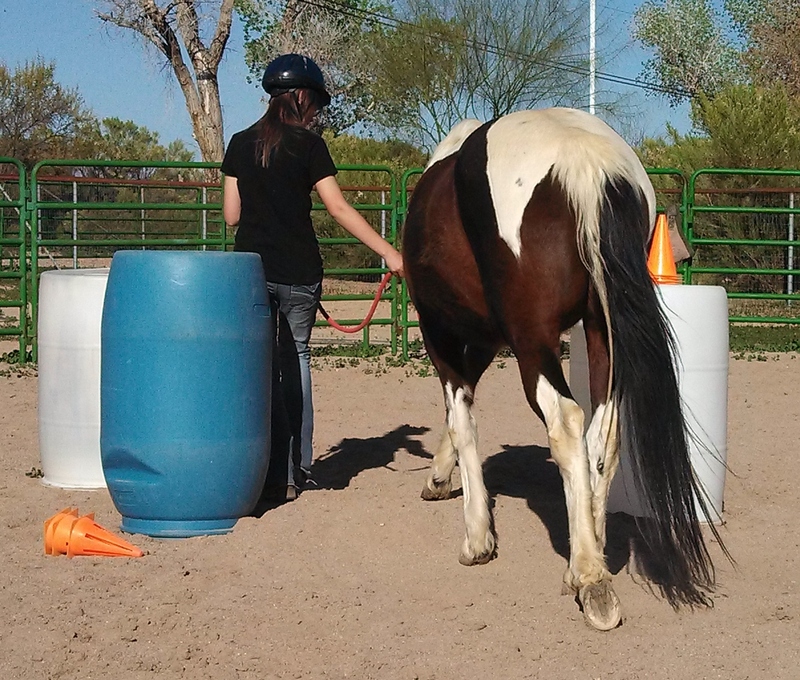 There are plastic barrels on the sides to keep horses from going around the bridge instead of over and in watching am wondering if it’s the toys the kids left or the barrels or the bridge or the combination that bothers her Removing toys helps but isn’t the solution. Is it the barrels? We remove the bridge and lead her between two barrels. Success with the barrels so add the bridge back and she won’t go. Or, if she does go forward it is jump, leap again and the dangerous part for the person with the lead rope is we never know where she’ll land. Now Sam (Samantha,) today’s helper, is a natural with horses. She has a quiet energy that the horses love and still seeing life thru a kid’s eyes suggests putting sand on the bridge to make it look more like ground, bury it a little. Ok might as well try. We kick sand on the bridge with our feet. Nope, she can still see it but the seed is planted. What if we cover it so she doesn’t see it by moving sand up against the edges and then putting more sand on top. So scooping more sand on the top of the bridge and up against the edges so it looks like the rest of the round pen we try taking her over again and instant results. She calmly walks over, doesn’t even hesitate. She just follows the leader. Now let’s remove sand a little at a time and see what happens. We scrape some sand off with our feet and each pass is the same, quiet cooperation. More sand is removed from the bridge until it is fully exposed and the results are the same. 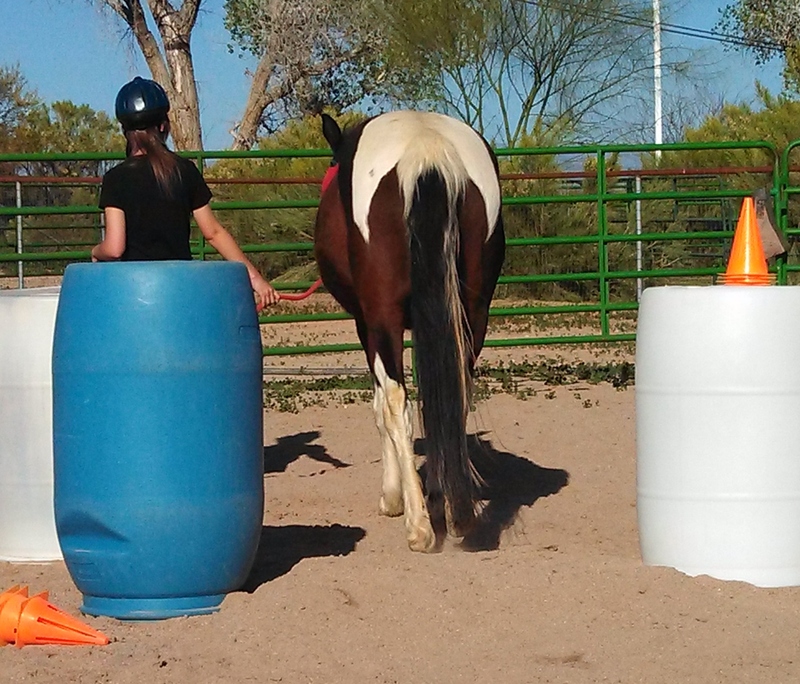 The barrels are changed up, the handler is changed up and again Chanoah walks over and over again, even stops on it and stands on it. Time and time again she goes over the bridge and this was accomplished in just a few minutes when we had literally tried for months to get her to touch it or walk over it and not jump it. 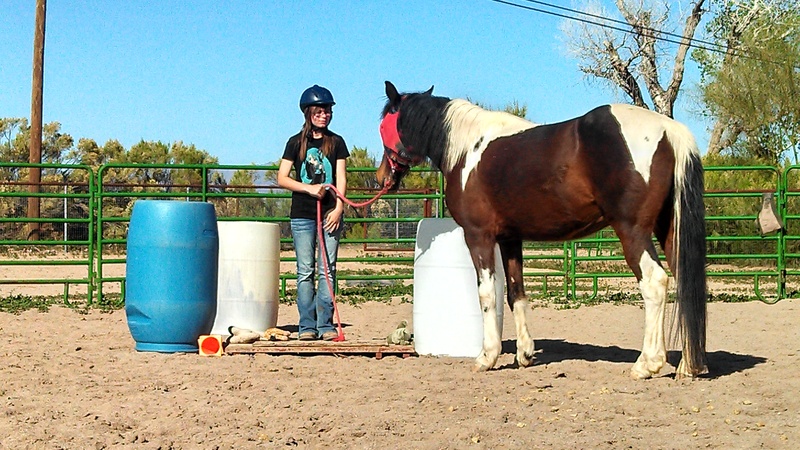 This horse taught us how she sees things and I wonder if this would work for other horses. Was it just her or was it thinking outside the box…inside the pen? 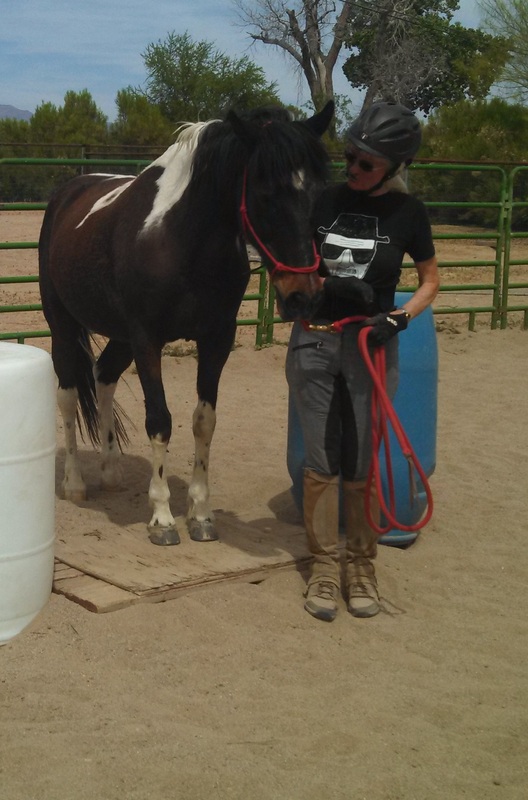 Image | This entry was posted in Uncategorized and tagged animal, attitude, barn, behavior, Deb, gelding, healing, herd, horse, horse behavior, horses, lesson, mare, ranch, round pen, sand, scared, teach, train. Bookmark the permalink.